Today I am preparing a message for New Day Community Church in Stockton that has a special Thanksgiving Day Service tomorrow, followed by a Thanksgiving meal, and I have been invited to speak. I am not sure if I am more excited about talking during the service or presenting my Thanksgiving stuffing at the meal. And since I am preparing both at the same time, I thought I would add notes on both. 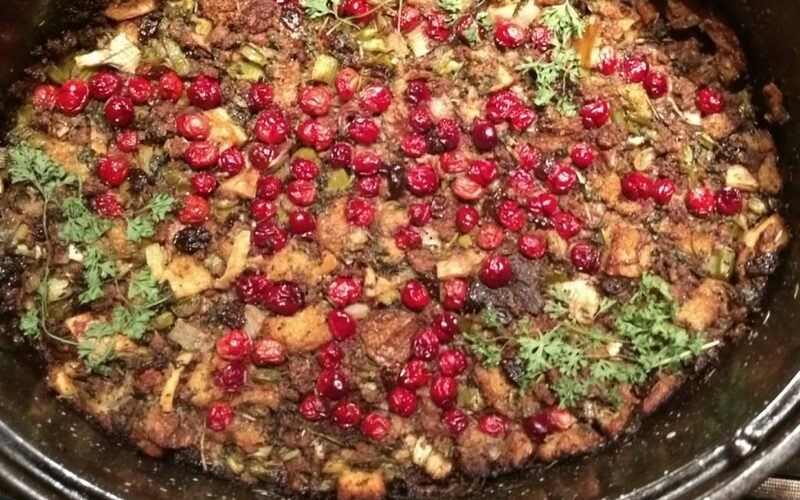 Besides, my chef daughter Elizabeth asked me yesterday for my stuffing recipe so now is a good time to share my thoughts on my stuffing and also my message which deals with a spirit of thanksgiving when things go wrong, go upside down, as they did for me last year when I lost my wife of 29 years to malaria in Africa. First of all, the stuffing. It’s different for me every year and I don’t have exact measurements but I can tell you that the first thing I do is roast a chicken. This gives me the stock I need to add the right taste long before the turkey turns up. And I put the heart/liver/neck etc in a pot and boil it for 20 mins to get even more stock which gives taste and moisture. 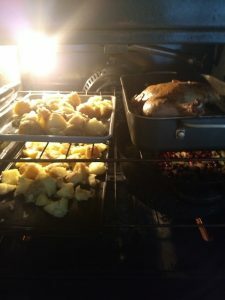 And since I am roasting a chicken, I might as well roast a few potatoes also. 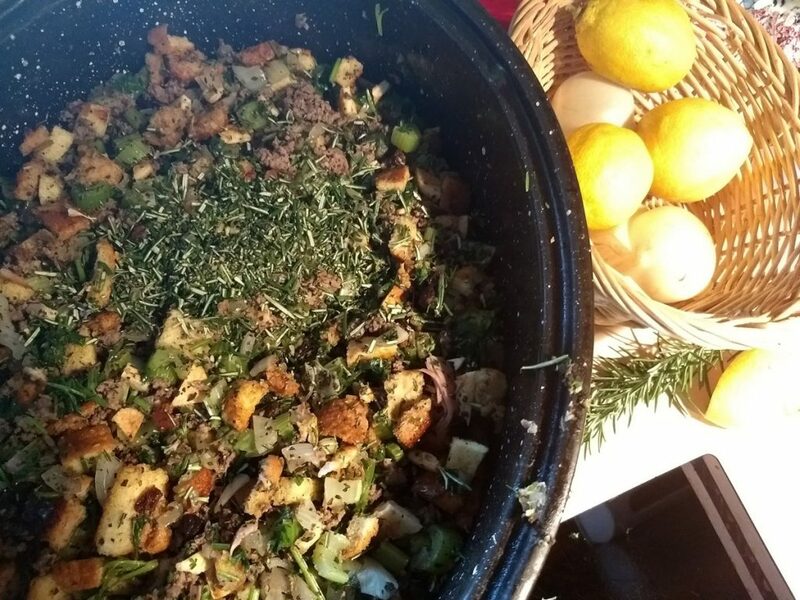 I will get a separate meal out of this – roast chicken and potatoes for my family, but no gravy because all the juice and stock will go into the stuffing. The big players for the stuffing are celery, onion, and meat. I sautée each one separately in butter and throw them into a large bowl. I usually do bacon and mushrooms but don’t have any right now. And my kids hate mushrooms so I am used to not cooking them, but I totally recommend them. For the meat, I like to mix it up with bacon and different minces, pork is good. I have used some rabbit before for a more gamey taste. But today is beef because its all I have. The other big player, apart from croutons (which I will talk about in a minute) is parsley. I used a big bunch of it, cut roughly but not chunky. And rosemary needs to be present – thyme might suffice – but rosemary is a necessity. I had to sneak into my neighbor’s yard to steal some but I told them 6 months ago I would do this on occasion and they were cool with that. But what about that message. Ah yes. The text is Ephesians 5. Paul borrows here from Isaiah 60:1 but takes a little license in adding his own spin. I want to do the same thing with this passage. Most people read it in a prescriptive way – a list of do’s and dont’s, which is fine. Giving thanks is a command. Yes. An argument can be made for that and I could make it also. 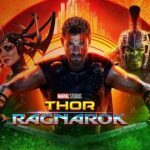 But there is a deeper layer here that I see as descriptive – a pattern, a journey, a teaching on not only what to do, but what happens when you do that. And this is what I want to share tomorrow. You will gain perspective, you will be illuminated, enlightened. You will understand what God is up to and you will speak out on behalf of that truth. This will affect your life – you will recalibrate your life, your actions, your habits to align with what you know of God and what he is doing. What is good, what is right, what is true. This will be your new default setting. 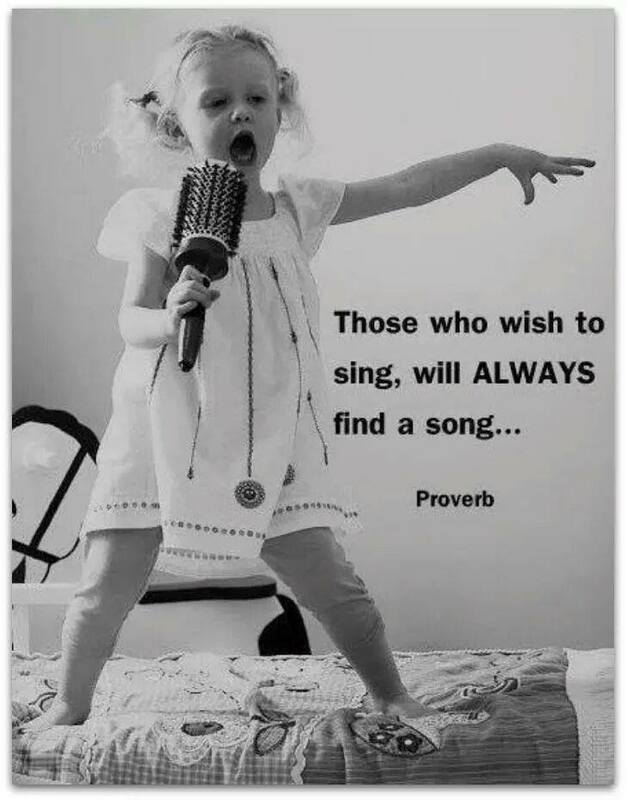 God will put a song in your heart. That song will play even through the most difficult circumstances. You will have a soundtrack, and its called “thanksgiving” and that will spill out into encouragement to others. Thanksgiving will also become a new default setting. Just like a drunk person is controlled by alcohol, you will be consumed with and controlled by God’s Spirit. This will change your demeanor, alter your posture, define the way you hold yourself and the way you relate to other people. You will be a person characterized by thanksgiving and not a person who bickers, judges, fights, complains or sees life as half empty. This god-filled-ness will also spill out into other relationships including the way you relate to others, as one who uses your song to encourage and uplift others who need to hear, and as you relate to your spouse and your children and parents – you will be someone who easily surrenders and submits and finds common ground, seeking unity, rather than fighting for or defending your ego. OHHHH I just took the potatoes out of the oven. They are lovely and crispy. Nothing to do with the stuffing but this will be a great compliment to the roast chicken tonight. Speaking of the stuffing, I spruced mine up with lemon juice, sauteed garlic, and raisins. I usually add orange zest, and to be honest it really needs it, but don’t have any oranges today. For the liquid, which is really important because you don’t want your stuffing dry, I added orange juice, white wine, stock from the liver/heart, and stock/juices from the chicken itself. Melted butter also works and I waited until the very end until pouring some all over the top and over the cranberries so they would turn golden brown and not burn. This is really lame. I spelled the word “THANK-FUL” with the cranberries. You can’t even read it. You need to ask for the gift of interpretation to even see it. But thats OK. I know it’s there and its a teaching embedded into the stuffing that will impact people, even subconsciously, but the most important thing is that it has meaning for me. Oh yes, those croutons. I took the rest of our bread, cut it up into cubes, and baked it in the oven until it was firm and a little brown. They need to be robust enough to handle the liquid. And I added herbs – whatever I had. Sage is awesome. Thyme is marvellous. I had neither, but, as I say, I used what I had. I also ran short on bread so I scraped off the pizza toppings from the pizza I made last night, cut up the bases and threw them in also. OHH and speaking of leftovers, I only ate half of that amazing Cubano sandwich from Cuban Kitchen in San Mateo yesterday so the ham and pork was also cut up and added to the stuffing. HA!!!!! Last year I lost my wife. She died of malaria and other diseases. It was the darkest time of my life. I couldn’t sleep alone in a bedroom. I couldn’t make decisions. 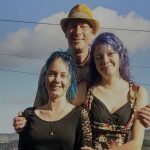 I lost the other half of myself and after 29 years of oneness with a single person, that is pretty much most of my life and certainly the life I was used to. On top of that I was really sick for a really long time, surviving the diseases that took my wife but basically unable to function for many many months. And yet, throughout the entire time, I felt God’s presence in a calming way, knowing deep in my heart that He is good, He is faithful, He is patient, He is caring and He will look after me. He knows whats up and that spirit of thanksgiving that permeated my mind and heart was not a drummed up motion of obedience but rather the overflow of truth, of what was real. Some people think God is distant and occasionally invades earth to bring disaster or tragedy. I see God as near, intimately connected to us and everything else, constantly enlivening and sustaining His creation, always standing guard and protecting us, and yet occasionally and empathetically removing his hand when He knows the time is right. The name of my song was thanksgiving. It was there all the way through the devastating process of losing my wife and explaining to my youngest daughter that she no longer had a mother. I am not being chirpy here. I am not being naive or brainlessly religious. Yes IT HURT. IT HURT MORE THAN ANYTHING IN MY LIFE and I was hurled into the Upside Down world of darkness, solitude, confusion, fear, GRIEF, emotional pain, and loss of hope for the future. I was BROKEN, plunged into grayness, emptied of life, emptied of hope. I am not reducing that reality or downplaying the significance of what happened to me. I am just saying that there was a soundtrack playing the entire time, a song of thanksgiving. And at my best moments, my grief gave birth to gratefulness. I am thankful for so many good friends. I am thankful for 29 years of marriage to the most wonderful woman on the planet. I am thankful that I got to say everything to my wife before she went. I am thankful that my wife got to finish her race and go out in the way she always imagined, in the country she loved. I am thankful that my daughter was spared from disease and that I have 5 wonderful kids. I am thankful for a softer heart and new wave of consideration for others. I am a different person – more in tune with suffering and more empathetic to those who are going through loss. I am thankful for the next season that is coming upon me and that I have the freedom to enter in. Grief has become my friend and my reminder of a wonderful life with a wonderful woman. My grief is warmer now than it was last year. My grief and the grieving process I have embraced has allowed me to push forward into new levels of understanding and awareness. That has given me a softer heart, as I said, and it has also positioned me to be of help to others who are also grieving. God comforts us so that we can comfort others. When you lose someone, a lot of other people, more than you can imagine, also lose someone. Grief is a shared experience. Our friends feel the pain of our loss but they also struggle with their own loss. They find it awkward to talk to us about it. But the healing we experience is for them also. A few months ago one of my wife’s best friends lost her husband. This is what I told her. It’s a strange dance this grief of ours. We hold our own sadness and allow the processing to continue thru it’s various stages, knowing it moves forward step by step, finding firmer hold with each telling of the story, with each new person entering into the story and at the same time we become priests for others who find it awkward to enter, but know that they need to. We hold the keys for them. We give permission. We invite them into the dance and make it easy for them, we suggest, we put their words out in front of them, we show the appropriateness of the conversation, the shared hurt of loss, the rightful pace and flow of what needs to be said. Being closer to the pain and further along in the process, we hold out our leading hand and invite others into the dance, into the spiral of healing. My hope tomorrow, at the church, is that other people who have experienced loss, whether the loss of parents or children or spouses, divorce (which can be far more devastating than the loss of a spouse), the loss of dreams, whatever it is they have lost, that they might enter into that spiral of healing, and find themselves in that dance, with God, where the juxtaposition of pain and joy, of grief and thanksgiving, of tears and laughter, might come together to find healing, wholeness, hope, and a song of thanksgiving that will play on and on. Amen. The stuffing is ready. Its not completely cooked with that attractive blackened burned look but I need to take it to Stockton tomorrow and they will heat it up right before the meal and I think it will come into its own at that moment. I might bring some parsley to freshen it up on location. If you look really carefully, you can almost see the word “THANK-FUL”. Almost. And thanks also to Monte Fisher for leading my grief recovery group! 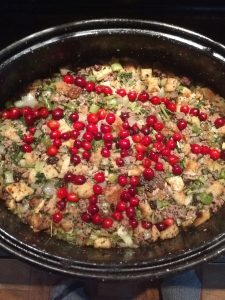 Your stuffing looks amazing, and your words about grief ring true to me, as one who has gone through a difficult divorce I too have found myself being able to give thanks, and it has made me a different person, less brittle and more compassionate. Peace be with you, and Thanksgiving blessings. I’m finding out long after the fact, but I’m so sorry to hear of your wife’s…I don’t even know what to put here, because death it is, and your words reflect the deep grief as a result, but it was also a passing, and your words reflect that as well. You were traveling alone back in 2011 when we met at Cornerstone (I was one of the riders in the car that picked you up as you were walking out of Bushnell towards the site), and you didn’t go into family matters, but it was obvious she was an extraordinary woman, and I sitting here with tears thinking about you losing her. My prayers will be with you and your children, as a loss like this can’t be papered over on this side of heaven.